The Lester W. Strock Award is given by the New England Section of the Society of Applied Spectroscopy in recognition of a selected publication of substantive research in/or application of analytical atomic spectrochemistry in the fields of earth science, life sciences, or stellar and cosmic sciences. More details on the award are available from the Society for Applied Spectroscopy. Professor Laserna’s current research interests include laser-induced breakdown spectroscopy (LIBS); time-of-flight mass spectrometry; surface analysis using laser ablation with optical and ion detection; laser remote chemical analysis; on-line and fieldable analytical instrumentation. Application areas comprise analysis of energetic materials; development of sensors for CBNRE threats; lasers for cultural heritage; and LIBS and Raman spectroscopy for space exploration. 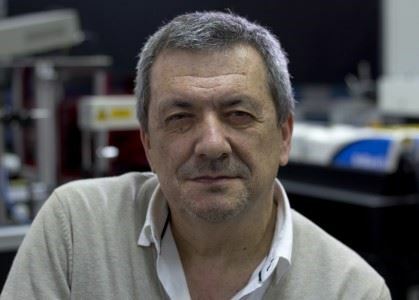 Javier Laserna is associate editor of Applied Spectroscopy, and member of the advisory board of Spectrochimica Acta, Part B – Atomic Spectroscopy, Reviews in Analytical Chemistry, and the Open Journal of Analytical Chemistry. Professor Laserna was awarded with the RSEQ National Award for Research in Analytical Chemistry in 2009 and the SEA National Award for Research in Applied Spectroscopy in 2010. He is co-inventor of 6 patents held by the University of Malaga and has published nearly 300 papers plus 5 books and book chapters. 1984 Gary M. Hieftje, Stanley B. Smith, Jr.